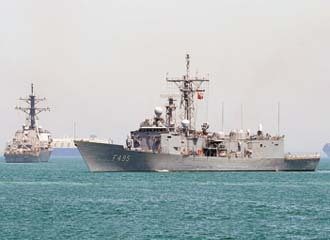 The Turkish frigate TCG Gediz participates in NATO operations in the Suez Canal. Formerly an Oliver Hazard Perry-class frigate, the Gediz has been upgraded with the Genesis combat management system, which was developed by the Turkish navy and implemented by Turkish industry. The longtime NATO ally blazes its own trail in military hardware. While the world’s attention largely has been focused on areas of conflict, one NATO nation has quietly developed an indigenous defense industry that is poised to be a significant player in international military procurement. By focusing on developing technologies and capabilities within reach, Turkey has developed a domestic defense technology base that spans all military activities on land, at sea and in the air. Turkey, which has the second-largest standing military in NATO, already has fielded advanced communications and information systems on a par with the top technologies found in modern militaries. It has established small land and sea platforms complete with advanced information technologies incorporated from the start of development. And, it is building a strong export base by teaming with allies in cooperative projects. Murad Bayar is the undersecretary for defense industries for the Turkish Defense Ministry. His organization within the Defense Ministry serves two roles: providing capabilities to the armed forces, and developing the country’s defense industry and its technologies. Over the past decade, Turkey’s procurement focus has been on product development activities, Bayar states. He offers that developing military technologies in concert with industry follows a pattern similar to that of the United States. The armed forces generate a requirements definition, which is then defined as a project by a procurement authority. Proposals to industry can be competitive or sole-source. Buttressing these procurements has been research and development. The government has several such projects, and these tend to aim at developing a technology base, Bayar reports. Turkey has some government research facilities active in these efforts, but it also relies on academia and industry. Most research and development programs involve two or even all three sectors working together, he says. For example, academia may lead in a basic research effort, but industry takes the lead when research aims at developing a specific product. In the recent past, Turkey’s military priorities have focused on helicopters, unmanned aerial vehicles (UAVs) and sensors. Bayar relates that Turkey has employed significant acquisition programs to meet those needs. Among the top electronics technologies under development are command and control systems, network-enabled technologies and sensors. Turkey is in the third year of an effort to shape its network-enabled capabilities to suit its military. As with other modern militaries, Turkey views network-enabled capabilities as a significant force multiplier for all of the platforms and infrastructures in which it has invested over the years. Bayar explains that the country is striving to match the enabling technologies with the requirements of the Turkish armed forces. The ministry has conducted feasibility studies that focused on technology capabilities, particularly technologies that either are available in Turkey or could be developed there. These studies encompassed universities, engineering consulting firms and armed forces experts. The result is a road map for Turkey’s military, which the ministry is sharing with its defense industry. The next step likely will be pilot projects, Bayar suggests, as the ministry prefers a step-by-step approach instead of launching a grand project. When it comes to broad information technology modernization, Turkey is looking to embed the latest technologies into weapon systems from the start. Domestic tactical command and control systems in particular are receiving substantial investment, Bayar says. Some successful designs already have been fielded. Bayar notes that the country’s Oliver Hazard Perry/G-class frigates have received the Genesis system, which he describes as a successful implementation of a Turkish-built combat management system. Developed by the Turkish navy and implemented by the Turkish company Havelsan, Genesis is a fully integrated management suite that encompasses all ship functions, including navigation, communications, sensors and weapons. Its open architecture allows greater interoperability and integration of upgrades to individual capabilities. It provides for modern sensor data fusion and automatic threat evaluation. Genesis also permits integration of Link-16/22 tactical datalinks. The Turkish army is using new indigenous tactical area communication systems. A family of full software-defined radios has been built by Aselsan, and production tests are underway. This radio family comprises handheld, backpack, vehicle and ship-mounted configurations, and they are compatible with existing counterparts already in use in the Turkish armed forces. Higher up the chain of command, headquarters facilities are using new management information systems. The Turkish air force has received a new command, communication and information system that comprises an integrated software platform. This system, which was developed by Havelsan after a long-term effort that generated millions of lines of software code, is managing major air force functions such as operations, logistics, personnel and finance. Bayar says that this system “covers all the bases” of air force and headquarters requirements, allowing commanders to have a full real-time picture of air force activities such as aircraft status on the ground and in flight. A similar system is planned for Turkey’s chief of staff headquarters, and smaller projects under development focus on messaging systems and other information technology applications. Bayar cites several domestically developed defense programs as successes. The country has developed good land vehicles, some of which have been exported extensively. The Cobra, a 4x4 armored vehicle, is in great demand internationally, he says. At sea, Turkey has developed a fast-attack patrol boat built by a local shipyard that is a popular export item. Bayar emphasizes that Turkey’s military exports are a product of cooperation between Turkey and its allies. That cooperation will continue, especially in areas where Turkey does not have the domestic industrial base to go it alone in product development. Aerospace is the foremost area in which Turkey seeks cooperative partnerships with allies, Bayar offers. While the country has done well with helicopters, it is seeking partners for helicopter as well as aircraft programs. “These are the ones that require heavy investments, and these are the ones that are not feasible for Turkey to [engage in] a large project alone,” he says. As an example, he cites Turkey’s partnership in the U.S.-led Joint Strike Fighter program, which also includes several other U.S. allies. This collaboration allows Turkey to incorporate its own air force’s needs into the program, he points out. Turkey also is partnering with six other countries in the A-400M European transport aircraft program. Turkey is not looking to partner in major military communications and electronics programs, however. Bayar offers that its companies largely have matured to the point where they are able to carry their own in developing systems for the Turkish armed forces. Turkey is playing close attention to interoperability, however, so it is following NATO standards development to ensure that its equipment is compatible with that of its allies. Accordingly, Turkey would consider partnerships for pooling common requirement sets to develop feasible solutions in communications, electronics and software. Turkey does not have a fully stated military export strategy, Bayar states. However, several domestic product areas seem to have strong export potential. Land systems from Otakar, BMC and FNSS are drawing attention from international buyers. These three companies offer a full portfolio of land systems that are competitive in the global marketplace, he says, adding that these systems are based on technology from Turkey’s automotive industry. In addition to the popular patrol boat, other shipbuilding products are competitive in the world market. And, defense electronics—particularly communications systems—are strong internationally. “We are investing in Turkish capabilities for our armed forces, and Turkish defense industries—with these capabilities—will be a better partner for the defense industries of our allies,” Bayar relates. “They will be in a better position to work together with European or American companies on joint projects with their inherent capabilities. “In the long term, we would like to see Turkish companies as good partners for NATO and other allies,” he declares. The next strong export area for Turkish military technology may be UAVs. Effective UAVs are a key requirement for the Turkish armed forces, Bayar maintains, particularly for asymmetric warfare operations. Turkey has engaged in some partnership projects with allies as part of its efforts to develop several UAVs. Turkey has expended considerable development in domestic UAV production, and many are coming into prototype stages. Some UAVs are in production, and flight tests may take place this year. Vehicles include tactical UAVs and a medium-altitude, long-endurance craft.